✅DOCTOR WRITTEN HANDBOOK INCLUDED: Want to know more about your condition, treatment options available, our best tips, and exercises that can optimise the strength and function of your hands as well as aid recovery? Read our handbook for your complete guide. ✅EXCELLENT CUSTOMER SERVICE: With all questions answered within 24 hours by a team that includes medical doctors who offer a 100% satisfaction or money back guarantee and free sizing exchange, you can purchase confidently knowing you'll get any support you need. ✅COMFORTABLE COMPRESSIVE COTTON MATERIAL: The high quality blend of cotton nylon and spandex optimises comfort, allowing all day wear. See SIZING CHART (image 2 on left) for optimum fit. 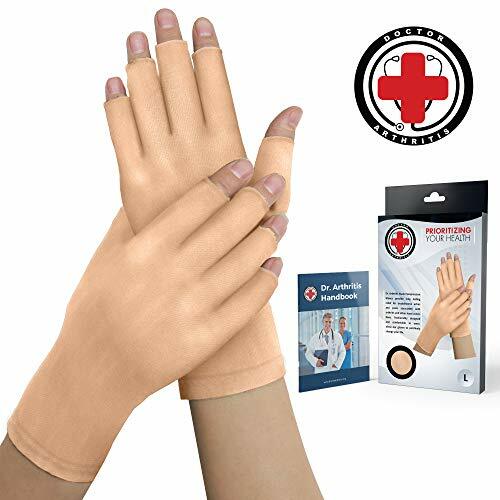 ✅MULTI-USE: Whether it's osteoarthritis, rheumatoid arthritis, Raynaud's phenomenon, carpal tunnel syndrome, Dupytren's contracture, psoriatic arthritis and even soft tissue and sport-related injuries our gloves will provide symptom relief in style! If you have any questions about this product by Dr. Arthritis, contact us by completing and submitting the form below. If you are looking for a specif part number, please include it with your message.